Let's face it, pretty much everything is a toy to a cat. But... how does the iPad cat toy stand up to claws? The video evidence certainly proves that technology can keep a kitty occupied, but I wonder about durability here. Felines were quick to catch on to the usefulness of Apple's iPad device. Although obviously not intended (originally) to be used this way, is this the most expensive cat toy to date? Four out of five cats surveyed say yes. The fifth cat was too engrossed in his gaming activities to answer. But wait! There's more. Iggy is not the only feline who likes Apple's new treat. Margo, the polydactal cat, wants in on the action as well. Does being polydactyl give her an advantage, I wonder? And here's a kitten getting her paws wet as a "Rat Assassin." Apparently cats don't waste any time adopting anything new. That includes your new sweater, a new cardboard box, or new technology. 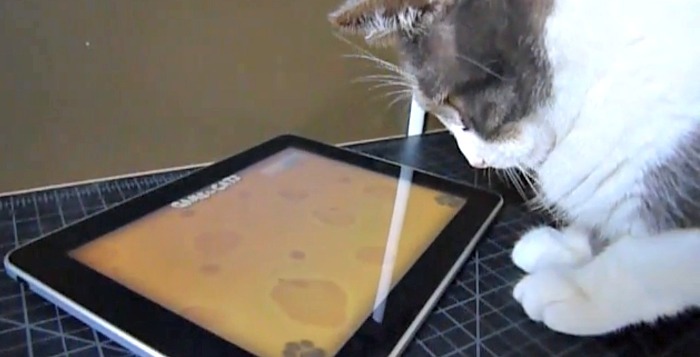 So of course the next thing is that game developers get into the mix and make games specifically for cats on the iPad. Some cats are into it, and some aren't. My most pressing question: what is your cat's favorite application? Cat themed games for humans (and cats). Note: Cats need to feel something in their paws, claws or teeth in order to get that feeling of "real world" hunt and kill satisfaction. For this reason, it's recommended that you give your cat something substantial to pounce on after playing with toys that don't provide that feel. Laser pointer toys are a prime example, but I believe it's possible that IPad games might fall into this category as well. It might be more satisfying if a furry or feathery thing can be pounced on during or after electronic playtime is over.